The National Hockey League has dished out their awards for the 2016-2017 season. Edmonton Oilers forward Connor McDavid picked up the Hart Trophy as the league’s most valuable player. He is the third youngest player to win the Hart Trophy, with Wayne Gretzky and Sidney Crosby winning at age 19. McDavid beat out Crosby and Columbus Blue Jackets goalie Sergei Bobrovsky to win the award. Speaking of Bobrovsky, he scooped up the Vezina Trophy as the league’s best goaltender. The 28-year-old became the only Russian-born netminder to win the Vezina Trophy more than once, as he also won in 2013. Bobrovsky beat out Carey Price and Braden Holtby to win the award. Calgary Flames forward Johnny Gaudreau took home the Lady Byng Trophy as the player who “best combines sportsmanship, gentlemanly conduct and ability.” Gaudreau beat out Minnesota forward Mikael Granlund and St. Louis forward Vladimir Tarasenko to win the Lady Byng. Ottawa Senators goalie Craig Anderson won the Masterton Trophy as the “player who exemplifies the qualities of perseverance, sportsmanship and dedication to hockey.” Anderson’s story this season went beyond hockey and to the heart of what makes us human, so the win is as well-deserved as it gets. Anderson bested Andrew Cogliano and Carolina forward Derek Ryan for the win. John Tortorella took home the Jack Adams Award as best coach in the NHL. The New York Rangers coach won the Jack Adams with Tampa in 2004 and bested Toronto’s Mike Babcock and Edmonton’s Todd McLellan to win the award. Nashville Predators general manager David Poile won the General Manager of the Year award. He was awarded by his fellow general managers as well as a panel of league executives and media. Poile beat out Ottawa’s Pierre Dorion and Edmonton’s Peter Chiarelli. Toronto Maple Leafs forward Auston Matthews won the Calder Trophy as top rookie in the NHL. He became the 10th Toronto Maple Leaf to win the Calder and the first since Brit Selby way back in 1966. He’s also the first America-born player to win the Calder since Tyler Myers in 2010. The Norris Trophy went to Brent Burns of the San Jose Sharks. He’s the first Shark to win the trophy, besting Ottawa’s Erik Karlsson and Tampa Bay’s Victor Hedman. The 32-year-old had 76 points in 82 regular season games and led the league in shots on goal. No, really. Boston Bruins forward Patrice Bergeron won the Selke Trophy as the best defensive forward in the league. It’s the fourth Selke win for Bergeron, tying him with Bob Gainey for the honour. Anaheim’s Ryan Kesler and Minnesota’s Mikko Koivu were the other finalists. 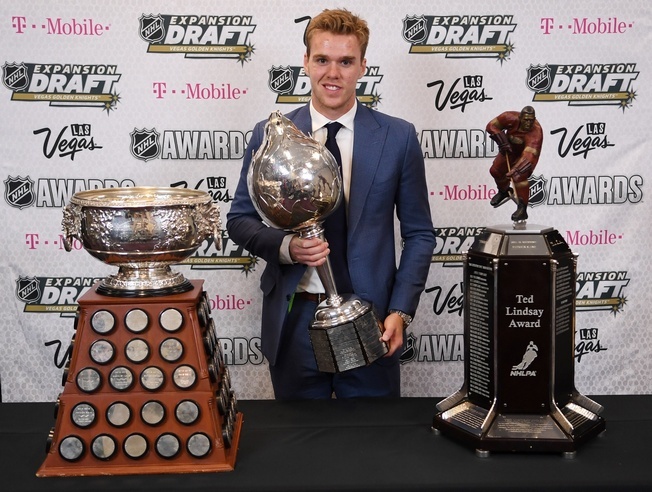 Edmonton’s McDavid also took home the Ted Lindsay Award for the most outstanding NHLer as voted by the players.